Today, blood cancers are the fifth largest group of cancer in the UK, with around 38,000 people being diagnosed every year. Blood cancers are also the third largest cancer killer, claiming more lives than breast cancer or prostate cancer. 2) Improve the quality of life for people affected by blood cancer. 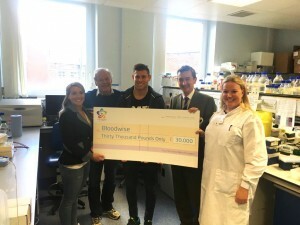 The work of the James Milner Foundation has helped to achieve these aims and from 2013 -2016 the JMF donated an incredible £105,000 to Bloodwise. In particular, the JMF has supported the Professor Saha’s project – a life-saving research study into childhood leukaemia. The project developed testing to identify those children who are likely to be resistant to chemotherapy as well as researched alternative ways to treat these patients. As Professor Saha’s project came to a close in 2016 the most recent donation of £20k was donated to The Childhood Leukaemia CellBank. Based just outside of Manchester, the CellBank is a central UK ‘biobank’ to A cheque presentation to Professor Saha at the Manchester Research Institute, 2016 collect and store samples of bone marrow and other tissues donated by children with leukaemia for use in specialist research projects. The ongoing success of this state-of-the-art biobank is critical to making the UK a major player in childhood leukaemia research and to make important new discoveries about how leukaemia develops and improve ways of managing the disease in children.